Many of us spend considerable sums of money on an audio system while paying painfully little attention to the environment in which we place it. That environment is almost always noisy and the source of structural and airborne vibrations that keep our precious systems from performing at anything like their optimal level. Let's refer to the minimization or elimination of unwanted vibrations as resonance control. No area of system design is more overlooked than that of resonance control. I know of no equipment rack better able to help one accomplish this demanding task than the Harmonic Resolution Systems M-1 rack that will be the subject of an upcoming review. Eliminating harmful vibrations, however, does not guarantee that one's system sounds the way one hoped it would. Getting a certain sound or character out of a system is a matter of tuning or 'sound shaping'. The important thing for every reviewer is that she have a system whose sound she knows extremely well. It's more important that the reviewer know her room and her system well than that her system sound great. Of course, it's preferable to have a system that sounds great - especially if you enjoy music. Beyond that, it is really a matter of preference what character a reviewer's system has. For my part, I prefer as neutral, transparent and highly resolving a system as possible not because I believe that only such a system will allow me to review components placed within it, but because I believe that neutrality, transparency and especially high resolution are necessary elements of a convincing musical reproduction. When I put a system together, I begin with transparent and highly resolving equipment. But you can put a lot of such components together and still be left wanting. You can have a lot of transparency and resolution without having much love or emotional engagement with the music. And that would simply not be all that satisfying. I have built my own reference system around Shindo electronics, Hørning Hybrid loudspeakers and Stealth interconnects and cables. That's the core of the system. There are other electronics that are as transparent as Shindo. In fact, the Kondo Ongaku preamp may be the most transparent-to-the source preamplifier I have yet to encounter. But I have settled on Shindo because in addition to its transparency, black background and high resolution, all of their components with which I am familiar put the kind of meat on the bones that I cannot live without. Even so, my system doesn't always sound great, no matter the quality or character of the source I put in front of the electronics. Sometimes the tonality is too light; other times it may be bit bottom-heavy. There are times when it has sounded a bit sluggish even. I never start my review process by attributing the shortcomings in sound to the component I have placed in the system. Rather, I take the system as a whole and commence tuning it. My goal is to put the system into equilibrium where it sounds as good as it is going to sound and where the new component gets an opportunity to shine, to be seen in its best light. This is no great act of charity; it is a minimal condition of fair reviewing. What this means is that I need a stash of tuning devices. It also means that I need to develop a skill at system tuning. In the past year or so I have begun to put together a small stash of tuning devices and components. More importantly, I have been paying close attention to other people who strike me as experts in this regard and from whom I am trying to learn the craft or art of system tuning. I have a lot to learn. It is too easy to refer to those who are masters of system tuning as tweakers. God, I've run into a lot of tweakers in my time who couldn't tune a guitar with the benefit of a guitar tuner. They put one Mpingo puck here and take pleasure in the fact that it changed the sound of their system; then they put a damping slab on top of their preamp and note that change as well. They are doing little more than spinning their wheels, wasting their money and time while adding nothing of interest to the sound of their system. I imagine that some of these folks are on occasion even audio reviewers. Truly skilled system tuners are a rare breed; they have good instincts, a wonderful ear and a lot of patience. They also listen very carefully. At their best, they can shape the sound of system with a minimal number of well chosen 'tweaks' or tuning devices. Most tuning devices are feet or dots or pucks. But there is a sense in which cables, power cords and boards can be tuning devices. They help shape the sound of one's system, sometimes by eliminating resonances, sometimes by shifting resonances to particularly sympathetic regions, sometimes by apparently pure magic. No self-respecting audiophile or reviewer can do without at least some tuning or sound shaping devices. Among audiophiles, certain devices have secured a near legendary status  those from the folks at Combak/Harmonix and those brought to you by the monks of Shun Mook, in particular. I have heard analogue setups be transformed by the Harmonix record clamp, and I recently witnessed the entire treble region of a particular loudspeaker I am fond of open up as the result of being topped off by three Mpingo pucks per side. I have also heard John DeVore's wonderful little Gibbon 8 loudspeaker transformed into near reference quality by the placement of four Combak tuning feet under his supplied spikes. By the same token, I have heard my own Hørning Hybrids become sluggish and weighted down by these very same feet. Enter into the brave new world of sound shapers, the ERaudio Space Harmonizers. First a word about ERaudio, then a whole lot more about the Space Harmonizer. ERaudio was founded in 2000 in Novirbirsk/Russia. Valery Pankov has served as president since inception. 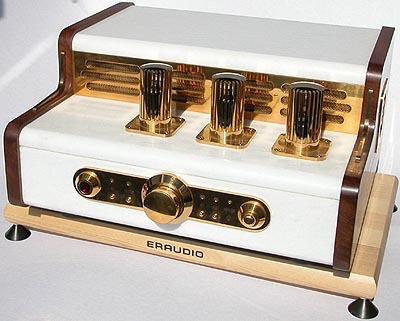 The company offers an unusual array of products: very interesting looking tube amplifiers and preamplifiers, cables, the Space Harmonizer and violins. That's right: violins. Strangely, this is not the first audio company connected to violin design and manufacture. Over the years, I have owned (on and off) at least three pairs of European Holophone Loudspeakers. The speakers were designed along principles developed as the result of psychoacoustics research at the University of Belgium. Using paper cones and fiber dome tweeters, the speakers themselves were built by a Belgium violin manufacturing company during down times. These speakers were tuned boxes designed to play like instruments. They were relatively small floorstanders and they could fill an enormous room with sound that was powerful, dynamic and emotionally absorbing if somewhat veiled and lacking a bit at both frequency extremes. 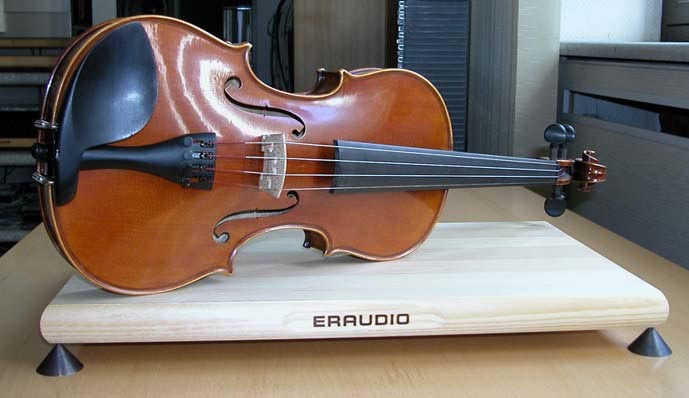 The folks at ERaudio have more than a little bit in common with those at the now defunct EHS - not just violins but the shared belief that the fundamental connection to music is emotional. As the folks at ERaudio put it, "We spend most of the time on the reproduction and restoration of the music's emotions," with correspondingly less time devoted to taking technical measurements and designing according to those findings. The Space Harmonizer itself grew out of the use of violin soundboards as a platform or foundation for the amplifiers the company was building at the time. It seems the violin soundboard transformed the sound of the amplifier. The amplifier designers were so impressed with the impact of the soundboard on the performance of their amplifier that others within the company were set on a research project testing the effects of various woods on sound reproduction. From this procedure, the Space Hamonizer was borne. The Space Harmonizer is made of 100-year old Siberian cedar which is cut into resonant bars. The bars are then glued together into platforms of various sizes. Each bar is presumably tested for its resonance not scientifically but by ear. Given that the sound of the bar in isolation will be related to but nevertheless different from the sound of an entire platform, it follows that those who test the individual bars by ear have to make predictions about how each piece will sound when conjoined with other bars in a completed platform. The net effect is a reasonably large error rate and only a relatively small number of bars make the grade. The website is silent as to who the testers are, what the "testing by ear procedure" is for individual bars and the characteristics they look for in particular bars and the like. In addition to the actual platform, each Space Harmonizer is fitted with four very small glue-on rubber disks and four steel cones. 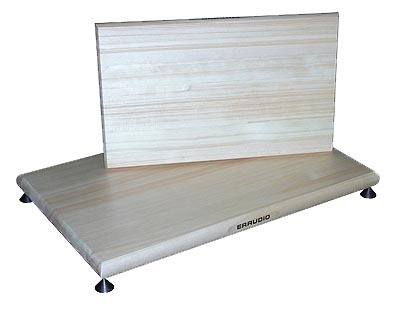 Both are used for decoupling the Space Harmonizer from the rack, shelf or floor. The relevant component is then to be placed directly on the Space Harmonizer. The company recommends that the Space Harmonizer should be used first with loudspeakers to experience the greatest effect. It can also be used with electronics and various sources. Any component can be tuned after all.